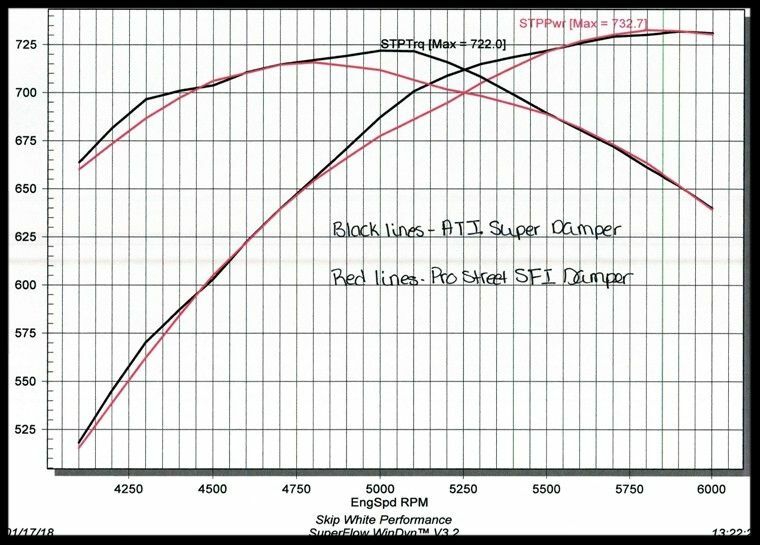 SBC CHEVY ATI SUPER DAMPER, SFI RATED, INTERNAL BALANCE, 7.704" FOR SBC CHEVY 350, 383, 406, 427, 434 ENGINES. Please read this complete ad and you will have a better understanding of why the use of a premium damper is a must on most high performance engines. 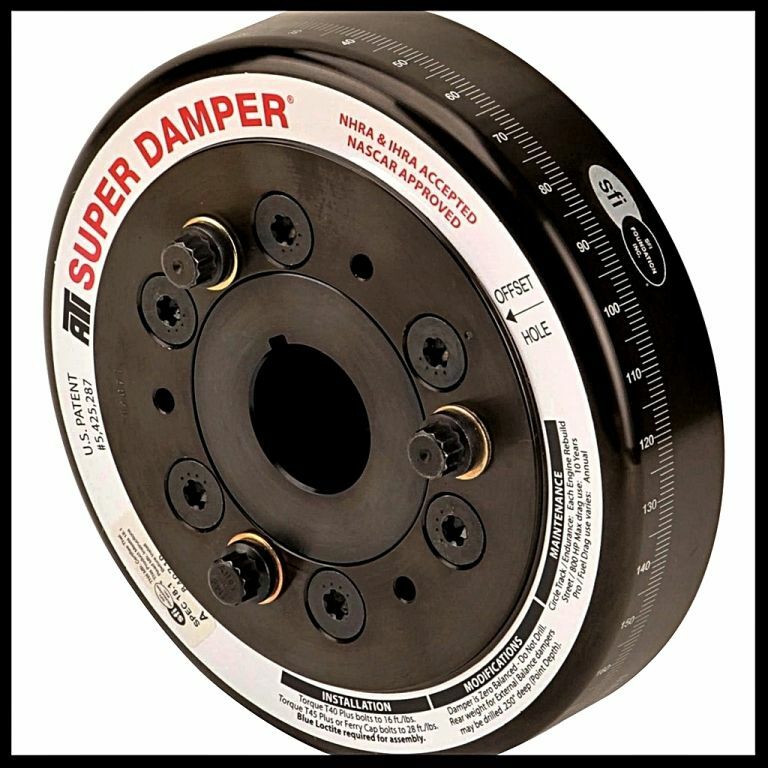 The patented ATI Super Damper standard harmonic balancers are designed exclusively for high performance engines. Inner and outer shells are available in aluminum or steel, and contain a steel inertia weight. The inertia weights have six (2-ring design) or eight (3-ring design) computer-machined grooves to retain the proper durometer O-rings (dyno tested for each application). Whether you race or just drive on the street, ATI harmonic balancers are the perfect choice. DYNO RESULTS SHOWING DAMPER FAILURES. All engines shown below were pump gas street rod engines, sbc and bbc. 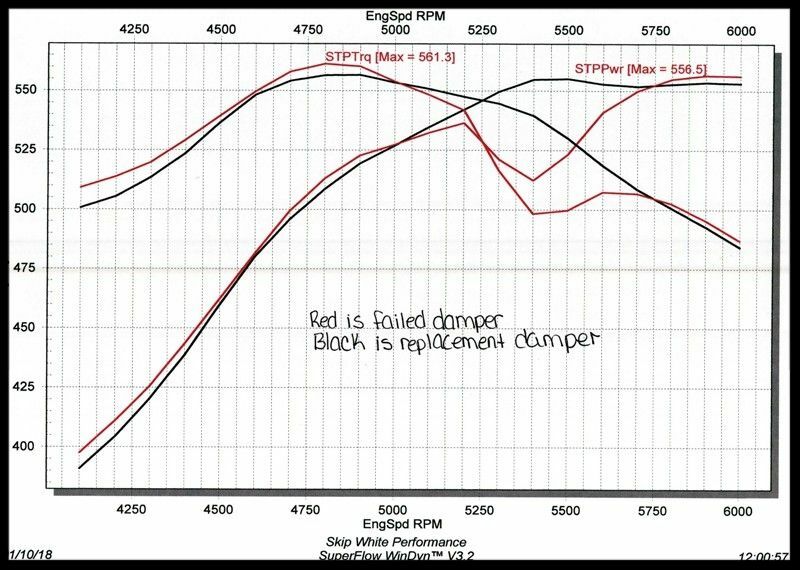 In the dyno report below, you are seeing our first test of what we assume is a normal functioning damper, then replaced it with an ATI Super damper. The dyno reports listed further down are what led us to this test. 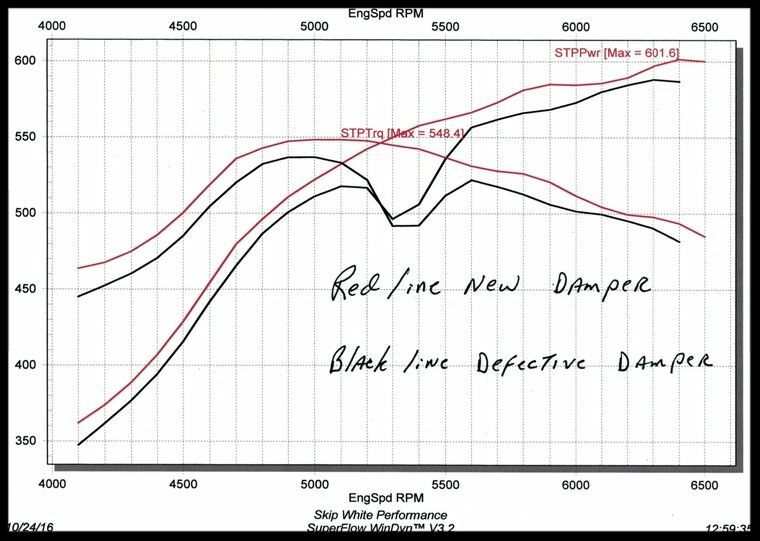 The reports below demonstrate why it is worth spending a bit more money on the damper for your high performance engine. Lower cost dampers are not designed to operate in these high RPM applications and will have trouble dampening the harmonics throughout the RPM range. 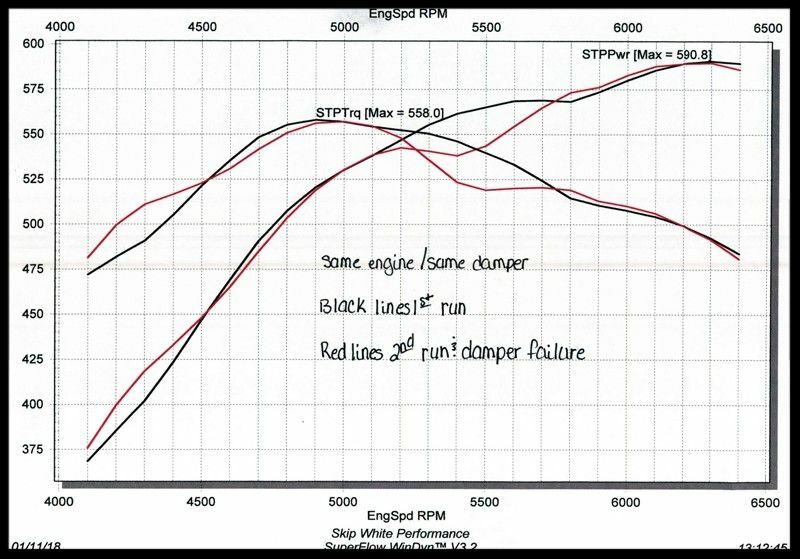 These harmonics in this rpm range are very damaging to the crank, bearings, timing chain, and valve train. 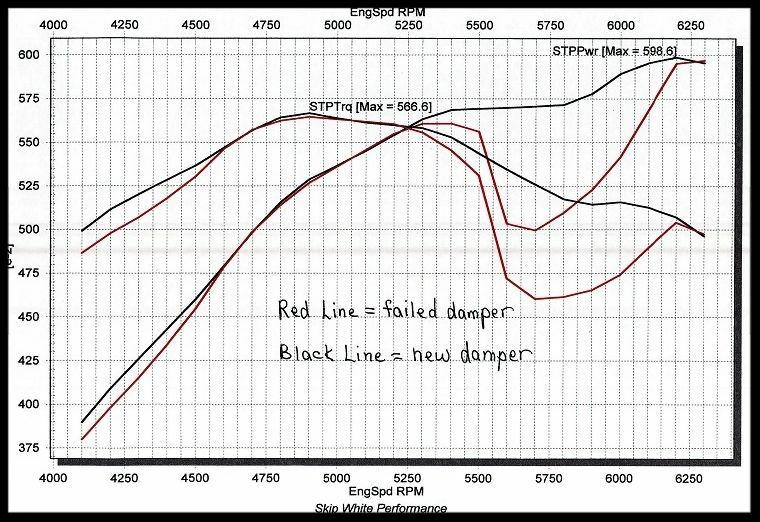 If a damper goes into an all out failure as shown in the dyno graphs further down, then rest assured, the result will be serious damage in your engine sooner rather than later. The dyno graph below shows us something very interesting. What you are seeing is a damper that is failing after the first run. This shows us one very important fact. Just because a damper passed the first or all of the dyno runs does not mean it's going to stay that way for very long. As shown in the graph above, the failure may show up as a minor failure but the graph below shows that once there is any hint of failure, it will usually progress somewhat quickly. Strange how they rebound in the graph shown on these reports. 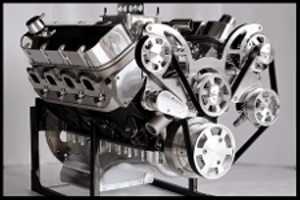 Note that even with the lower cost damper, the engine recovers once it passes through the region where the most damaging harmonics occur. However, do understand that the power loss shown will be the least of your problems if you continue running with a damper that is not doing its job throughout the complete rpm range. Engine component failure will be the result. It could be that we're asking too much of the low cost line of dampers. Lower cost dampers are more suitable for lower hp engines that have shorter stroke cranks, and max out in the lower rpm ranges. All of the dyno sheets in this ad had the mid-range performance dampers on them. All of these are from engines ranging from our 427, 434 and our bbc 572 engines. Those engines going forward will all be equipped with the ATI Super Damper. We have not seen such failures in the past, but that does not mean the engines were operating at their best. The reports below are showing outright failure of the damper. The massive drop in power was most likely caused from spark scatter in the distributor, due to excessive harmonics transferred up the line from the crankshaft. Some of the power loss would have also come from the actual harmonics not being dampened properly, and some could have came from harmonics passed into the cam/valve train. The graph below shows the worst failure of all. This problem would have been very difficult to pinpoint if it occurred with the engine in your car. This would for sure cause damage to your engine before long. Another failure on one of our 434 SBC engines. The nasty dip shown would lead to serious problems had this engine been allowed to continue running like this. The failures you are seeing in these graphs have occurred in a somewhat short time. It is obvious to us that it is a somewhat batch related issue, and these were all on pump gas street rod engines. As mentioned above, we're simply demanding too much from the low cost dampers. It would not take much of a flaw in the manufacturing of these lower cost dampers to produce problems. The solution is simple: spend a little more money on your engine and purchase a high performance damper. WARRANTY: ATI warrants to the original retail purchaser that all of their products will be free from defects in material and workmanship for a period of 90 days from the date of purchase. ATI will repair or replace, at their option, any part, assembly, or portion, after ATI's examination discloses it to be defective. ATI must be contacted to discuss a possible solution to the problem before the return can be processed. ATI dampers that have been installed are not returnable. Dampers must have their SFI sticker intact. Repairs or problems should be directed to ATI. ATI dampers are honed to fit OEM crankshafts and may not fit aftermarket crankshafts.